Keep track of your homebrew beer recipes in a convenient and portable journal for easy access on your brew day. The journal will support both extract and all-grain brewers of all skill levels. Both metric and imperial measurement units are supported. The book allows individuals to keep a record of the grains, extracts, hops and yeast used in up to 50 beer recipes. Other brewing procedure and tasting details can also be recorded, allowing the same beer to be reproduced and modified (unless it’s already perfect) once the first batch has been consumed and more is wanted! Got this for my boyfriend for valentine’s day because he and my cousin have been doing some home brewing. He hasn’t gotten a chance to use it yet, but from looking through it he says that he is very excited to fill it out. 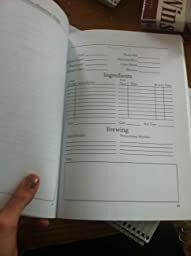 It gives you 50 tables and pages for notes to fill out while brewing so that you are able to make consistent batches of delicious brew. There are also several blank pages at the end to make more notes. Different and bigger than I expected! My father loves to brew beer and is always creating his own recipes. He is always writing them down on loose pieces of paper. This gift was perfect for him. It has space to write down the ingredients, the alcohol content, miscellaneous notes, which he uses as a critique area. Every recipe page had a blank page across from it, my father uses this to write down his tweaked recipes. Once he fills this book, he is planning on getting another one. I use this for writing extract recipes and there is plenty of room for each entry to add as much detail and you need. There is actually an entire page next to each recipe card to write notes. I think I will buy another when this one gets full.